There may have been a third meaningful vote on the Withdrawal Bill by the time you read this. Or Theresa May might have decided she didn’t have the numbers, decided against, and launched yet another week of Brexit chaos. It’s in the gap between meaningful and meaningless that Cold War Steve is at his savage best. Christopher Spencer created the Twitter account McFadden’s Cold War in March 2016, before the June referendum. 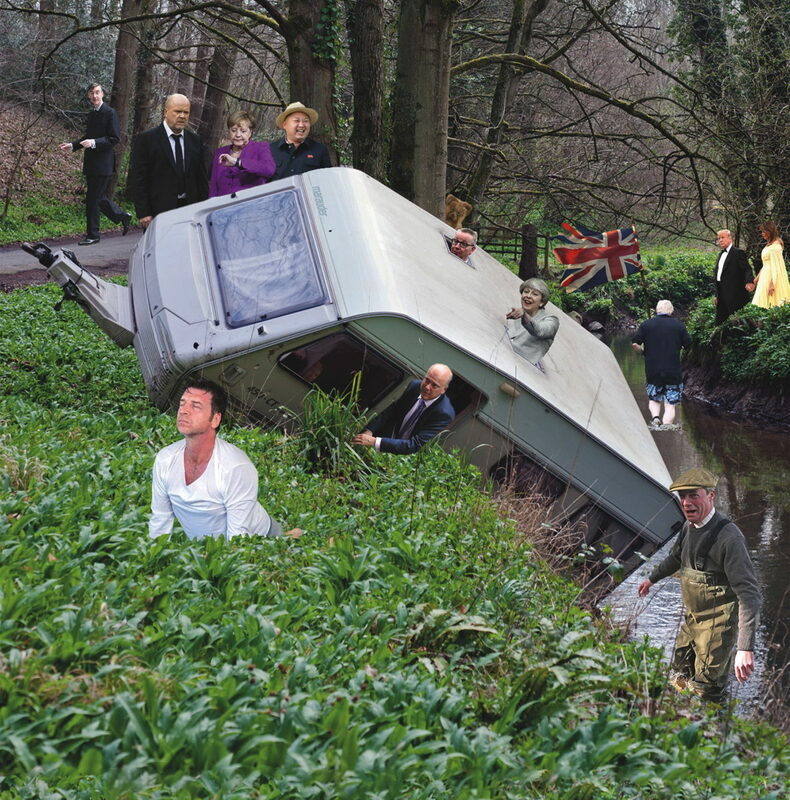 Art college-trained, although working in factory jobs and the public sector, Spencer used a cheap smartphone app to create photomontages about the Cold War era, often featuring Ronald Reagan and Mikhail Gorbachev but always featuring Steve McFadden, who plays Phil Mitchell in EastEnders. But the Birmingham-born artist’s Twitter account accelerated to another era 30 years on following the EU referendum. In came Theresa May and other British politicians, Donald Trump and Kim Jong-un, alongside celebrities including Noel Edmonds and Nick Knowles, who weren’t always pleased to be featured in the scenes he offered to his growing number of followers, now over 150,000. Spencer’s humour is dystopian and absurd, rather than pointed or political, as revealed by our cover and these images, created exclusively for Big Issue North. The Financial Times called him “apocalyptic but side-splitting”. In his way he’s as British as Brexit. Why did you create Cold War Steve? My Twitter site, McFadden’s Cold War, started out as a coping strategy. Having struggled with depression most of my adult life, I suffered a complete breakdown in early 2016. After a period of time in hospital, I decided to channel my energies into something creative. I’d messed about with digital collaging and created a few parody sites previously (one about Noel Edmonds’ hair). Putting Steve McFadden (as Phil Mitchell) into historical Cold War scenes was something that came from nowhere really. I immediately loved the incongruity of them – and thought, from an artistic point of view, that they made great compositions. I don’t know if he is aware of my work, but I would imagine he is – especially as some of his colleagues from Eastenders follow me. I hope that he would see that I use him in complete reverence – he is the everyman in the scenes, surveying his surroundings with existential angst, incredulity or bemusement. You’ve been acclaimed as the modern-day Bruegel or Hogarth. Are they influences or are there others? It is enormously flattering – and a bit ridiculous really – to be mentioned alongside Bruegel and Hogarth. They are big influences, along with Hieronymus Bosch, particularly in my grander, more detailed compositions. I like to include subplots, symbolism and grotesque characters doing unspeakable things – Trump, Farage etc. It’s common now for people to say satire is dead because reality’s too weird. How come your satire’s so alive? Just because everything’s gone full on nuts, doesn’t mean that it’s beyond satire. We need it more than ever and I have found that my individual way of channelling my anger and dismay at what’s happening to our country – via my art – is more effective than if I just sent out shouty rants. I guess my satire is relatively new – one reason obviously being the medium I use (Twitter) which is so immediate and people can interact with it in ways that weren’t possible before social media. I also try and make each image a unique piece of art, from an aesthetic point of view and with symbolism and meaning. The characters and backdrops I use also seem to strike a chord with people. It’s getting harder to ‘out-weird’ current events and previous Cold War Steve pieces have actually become reality. Does the response from fans you get on Twitter outweigh what I presume is the stick you get in what can be a brutal place? Twitter is a toxic place and I am so thankful for the following that I have. My followers are as fundamental to Cold War Steve as the actual compositions themselves. Their comments are always hilarious and insightful and I have personally gained so much confidence from all their lovely words. There’s been a number of occasions when hundreds of them have rallied round to provide support – and an ear – to other followers who may have found themselves in a difficult emotional place. Your book’s called The Festival of Brexit. Is Brexit madder than the usual festival experience? Brexit is perhaps madder than any festival experience that has gone before, including medieval carnivals, which I hope is reflected in the book. I have offered my services to the Prime Minister – to be the artistic director for the Fesitval of Brexit – and am just waiting for the call-up.